Hampshire Shakespeare Company opened its season last month with a tight, taut Hamlet that featured a thrilling, pyrotechnic performance in the title role. PJ Adzima is still in high school, but he brought not only an adolescent vigor that made the prince’s “antic disposition” both entertaining and scary, but also an incandescent intelligence that gave the set-piece soliloquies energy and depth. Watch out for this young man—he’s a star in the making. This week it’s The Tempest, in a thoughtful and whimsical production that contrasts nicely with the explosive tragedy and fits pleasingly into the company’s outdoor setting, its multilevel stage framed by the Holyoke Range and, last weekend anyway, illuminated by the rising moon. Director Martin Shell has foregrounded the play’s reputation as Shakespeare’s “farewell to the stage,” the summation of a life in the theater. Shell has made it not just a piece of theater, but a piece about the theater. At the outset, the actor playing Prospero, the philosopher/magician and exiled duke, enters and bows to the audience Elizabethan-style, pulls on his robe, knocks the stage floor three times with his staff a la French classical theater, sits down beside an old theatrical trunk piled with books, and the play begins. It begins, actually, with a scene that isn’t really in the script, but, devised from two later sections, sets the plot in motion more effectively than the usual chaotic storm scene. Here Prospero sets his servant-sprite, Ariel, to stir up the tempest that casts his old enemies on the shore of his island. The trio of Ariels make mischief as well as magic among the shipwrecked mortals. Invisible to the human eye, they turn leafy branches into thorny thickets and play tricks with the firewood Prince Ferdinand (Andrew Ferlo) is carrying for Prospero out of love for the old man’s daughter, Miranda (Catrin Lloyd-Bollard). All these gags are carried out in full view of the audience, inviting us to share the joke. Everything else about the production is similarly exposed. The tin thunder sheet is onstage, not out of sight. The music that “creeps by upon the waters” is played by woodland sprites—the Young Company of teenage extras—on African thumb pianos, ocarinas, Zube tubes and other homely instruments. Early in the run, the pace was still a bit sluggish and the production showed the signs of some late-day casting. But most of the leads are standouts, most of all Phillip Isermann. He’s an angry Prospero, still royally pissed at being usurped and marooned, but with an ironic self-regard and an almost childlike delight in showing off his magical powers. After this week’s run, the Young Company stage their own version of the play—this time with three Prosperos, too. 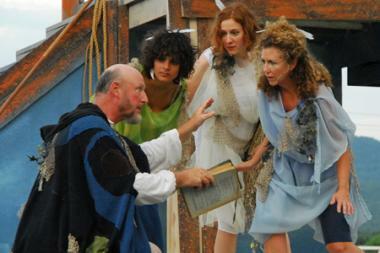 The Tempest: Through Aug. 1, Hampshire Shakespeare Company, Hartsbrook School, 193 Bay Road, Hadley. Young Company production Aug. 6-8. http://www.hampshireshakespeare.org.